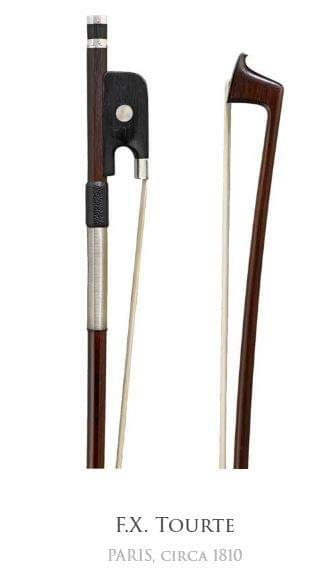 The name of François Xavier Tourte remains the most celebrated in the entire canon of bowmaking for justifiable reasons: he effectively established the ‘modern bow’ which – except for a few minor adaptations – has remained unchanged to the present day and the bows of his ‘golden period’ (c.1800 – 1825) display a stylistic harmony of form that is, arguably, yet unsurpassed. F.X. 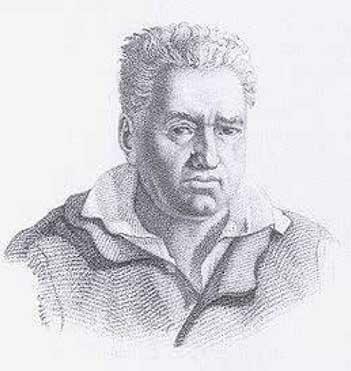 Tourte was born in Paris and is thought to have remained there until his death. Respected research suggests that he began his professional life as a clock maker, despite his father Nicolas Pierre (c.1700 – 1764) and his brother Nicolas Léonard (1746 – c.1807) being bowmakers. Accepting this to be the case, this early training would have given F.X. Tourte the requisite skills and attention to detail that would distinguish his finest work, particularly in the best bows of his golden period. It is thought that after Nicolas Pierre’s death, Tourte left the clock making trade and began working with Nicolas Léonard, the two brothers quickly gaining fame and respect amongst musicians for their open approach to development. The collaboration between the brothers ended c.1800 when F.X. Tourte moved to 10 Quai de l’École from where he worked until c.1830. By this time, Tourte had established the ‘modern’ camber, the all-important ferrule for the frog (to keep the hair ribbon evenly spread) and the pearl slide and metal back-plates. 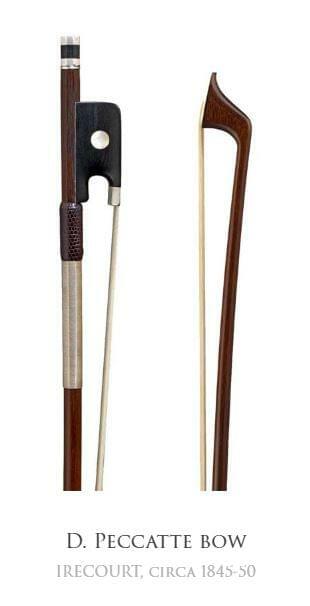 The culmination of Tourte’s artistry and craftsmanship can be seen in the bows of this period. The cello bow being offered here was probably made c.1810 and is relatively unusual in that it is one of Tourte’s ‘violin head’ models. (During this period, Tourte experimented with the form of the cello bow heads, making models from the classic, rugged ‘hatchet head’ style, to the enlarged version of a violin bow head, with variants of these in between). The head of this bow has been extraordinarily well preserved, allowing us to study the unaltered design and working mannerisms of the master. The silver headplate is original and it is nice to see the one-piece ebony lining without blemishes. Although it could be said that the violin head models are the most delicate of Tourte’s cello bows, there remains, nonetheless a certain ruggedness in the overall form ant the cut of the chamfers. The stick is round in section, made from the dense type of pernambuco that permitted Tourte to produce the remarkable bows that exemplified his magical ratio between resilience and elasticity. The dimensions of the stick produce a very elegant aesthetic, yet the handle is classically robust in form. Although it has clearly been much loved by players over the years, it has remained in very good condition. Unfortunately the original frog has been lost and the bow currently bears an anonymous (repaired) frog. The button, however, is probably original to the bow. It would seem likely that Dominique Peccatte had undertaken some training in bowmaking in his native Mirecourt before his departure for Paris in 1826: J. B. Vuillaume had asked his brother François to recommend an appropriate young man as an apprentice for his Parisian establishment and Peccatte must have been able to demonstrate a certain aptitude for the craft. Thus he joined the already successful Vuillaume where – oral tradition states – he was trained by J.P.M. Persoit. Peccatte’s tenure with Vuillaume lasted for around ten years, during which he made many extremely fine bows, the first of these clearly having been inspired by Persoit. Towards the end of this period Peccatte made many self-rehairing bows while developing his own ‘hatchet’ head design that would ultimately inspire many great bowmakers of his own and future generations. After leaving Vuillaume’s workshop c. 1837, Peccatte began an association with François Lupot II (who is attributed with the introduction of the underslide c. 1825). Lupot died in 1838 and Peccatte became the successor of his shop, making a prolific number of bows there until his return to Mirecourt in 1847. Thereafter, he continued to make bows of great quality, supplying Parisian shops (including Vuillaume) and his own clients until c. 1865. By c. 1840 Peccatte had fully established his style, featuring the grand, proud looking hatchet heads that were coupled with the very open-throated, slender-waisted frogs. The sticks were almost exclusively round in section, gradually becoming more triangular towards the head, a form which resulted in greater lateral stability in the musician’s hand. It was probably a little later that Peccatte began making his extremely elegant ‘swan-head’ cello bows. The bow being offered here is a swan-head model, dated by Bernard Millant in his certificate as being from c.1845-50. It is overall in very good condition, original throughout with the exception possibly of the button. The head is very elegant in profile, while at the same time being full in the cheeks. The carving and shaping of the head has been carried out with a great deal of care, resulting in a form that is utterly satisfying to the eye when looked at from any angle. The form of the stick is typical of D. Peccatte’s work, being gently triangular behind the head and gradually rounding out towards the lapping. The handle is showing signs that the bow has been played over the years, but it has been well maintained with only a little rounding of the facet edges and remains in very good condition. The frog is of classic D. Peccatte proportions, marrying well with the head in terms of elegance. The throat is archetypal of the Peccatte design, sweeping up in a generous, open curve from the low ferrule to the thumb-projection. The overall carving of the frog is complex in its contours, while resulting in a form that is uncomplicated and most pleasing to look at. Although there are some minor repairs to the frog, it is nonetheless rare to find a Dominique Peccatte cello bow in this condition today.